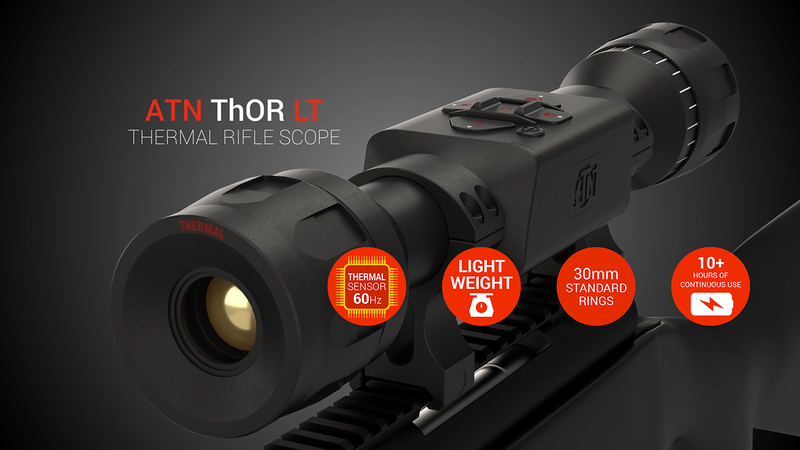 The ThOR LT is the lightest Thermal Scope in the ATN ThOR line, providing more versatility to mount to a Crossbow, Air Rifle, or other platforms where weight is a critical factor. Weighing only 1.4 lb/ 650 g and built out of Hardened Aluminum Alloy with Impact Resistant Electronics. Get the look and feel of a traditional scope with standard 30mm rings, 3" eye relief, and classic ergonomic design. "Light" - not only in weight but in features and ease of use. Sight in your scope with One Shot Zero, choose between 2 color pallets (Black Hot/White Hot), pick a reticle style and you are ready for an affordable thermal hunting adventure.